Subjects and Themes(Dreaming): Mina Mina , Karnta (Women), Kanakurlangu (Digging Stick), Ngalyipi (Snake Vine), Yunkaranyi (Honey Ant), Jintiparnta (Native Truffle) and hair belt. trips on foot back to (and lived for long periods at) Mina Mina and Yingipurlangu, her ancestral country on the border of the Tanami and Gibson Deserts. These places are rich in bush tucker such as wanakiji (bush plums), yakajirri (bush tomatoes), and wardapi (sand goanna). 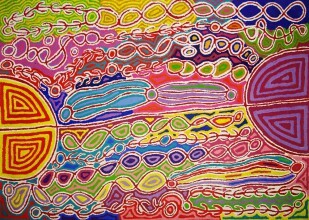 Most of her works depict Mina Mina or Dreamings connected to it: Karnta (Women), Kanakurlangu (Digging Stick), Ngalyipi (Snake Vine), Yunkaranyi (Honey Ant), Jintiparnta (Native Truffle) and hair belt.Judy was taught painting by her elder sister, Maggie Napangardi Watson. 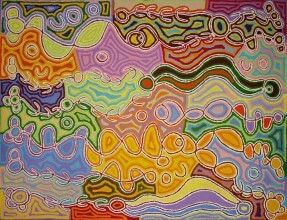 She commenced painting for Warlukurlangu artists for a number of years, developing her own unique style. 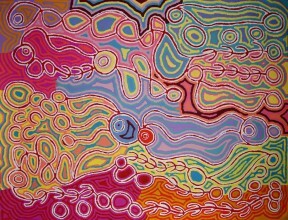 She transmits her energy to her work through her dynamic use of colour, and energetic "dragged dotting" style. 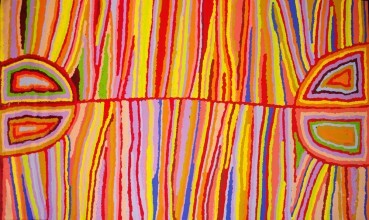 She is at the forefront of a move towards more abstract rendering of Jukurrpa by Warlpiri artists; however her work retains strong kurruwarri, the details which tell of the sacredness of place and song in her culture. 1995 Bellas Gallery, Brisbane 1995 SOFA, Miami, U.S.A.
1993 CINAFE (Chicago International New Art Forms Exposition), U.S.A. SOURCE: Birnberg, M & Kreczmanski, JB 2004, Aboriginal artists dictionary of iographies: Western Desert, Central Desert and Kimberley Region, 1st edn., JB Publishing, Marleston. 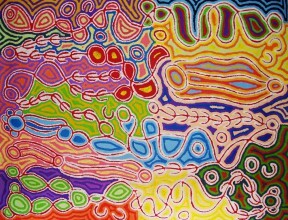 This artwork describes a story associated with the sacred area of Mina Mina to the west of Yuendumu significant to Napangardi and Napanangka women who are the custodians of the Dreaming that created the area. 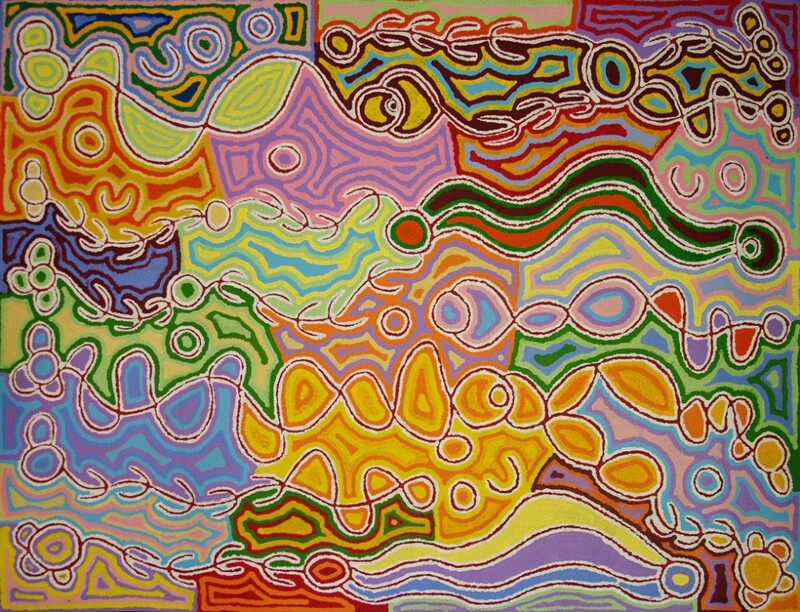 The Dreaming describes the journey of a group of selected women who travelled east gathering bush food, collecting snake vine and performing ceremonies as they travelled. 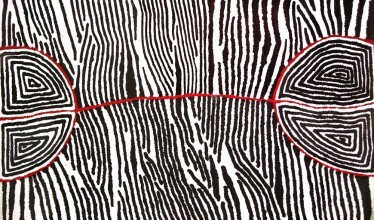 Through her paintings Judy recounts her journeys through the land when she and other Warlpiri women walked on foot for long periods of time gathering bush tucker such as Wanankijii, Yakajiri and Wardapi. Mina Mina country is a significant place for Napangardi and Napanangka women who are custodians of the Dreamings associated with the land.